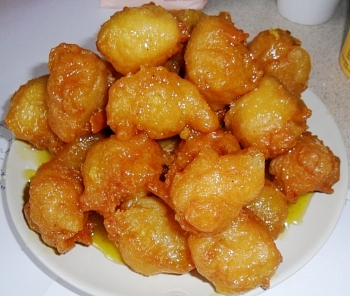 Milk-free, tasty, delicate, creamy, fried cakeballs in saffron syrup. out of the pack ready whipped. Follow the Saffron Syrup recipe here to make a normal batch of 2 thread syrup and keep it warm but not boiling. Irregular shapes that melt in your mouth. 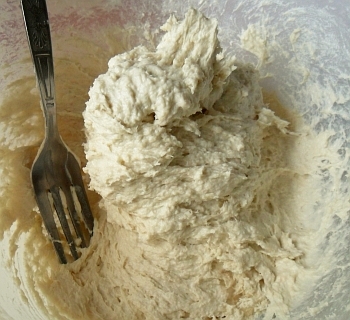 Put the flour and the baking powder in a medium-sized bowl and mix. Next you need to add the vegan cream - note that the batter mix will be fried in oil and then placed in the syrup. To make the gulab jamun melt in your mouth, use all 300g of the vegan cream. This unfortunately makes it difficult to shape when you drop the batter into the oil - however, you are not making them for sale or for a wedding so it doesn't matter at all what shape they are (you could make London double-decker bus shapes if you wanted). To make the round, firmer gulab jamun, use about 250g of vegan cream. in it and it is still stiff enough to stand up. Mix the vegan cream into the flour, stirring all of the time. If you are using only around 250g, add around 200g and mix it - adding small amounts of vegan cream and mixing in completely until the consistency is firm enough to roll but not so loose that it is sticky. If you add too much, you can always add some more flour. Heat the oil in the deep oil fryer to 160C. 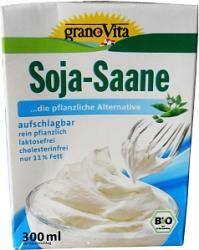 If you are using all 300g of vegan cream, use a fork to lower lumps of batter of roughly 1.5cm diameter into the oil. 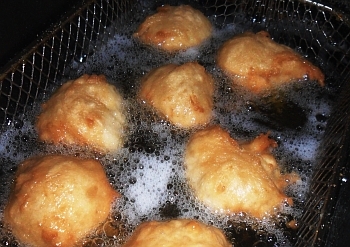 If you are using the stiffer mixture, use about the same amount but role them into balls and lower them into the oil. They will tend to self-turn - as the underside cooks, it becomes lighter than the top and will cause it to rotate. Some of them don't do this very readily and you will need to use a fork to help them. With this in mind, keep an eye on them and make sure that they are all cooking evenly. Batches of around eight or so will both fit in the fryer and also mean that by the time you have put the last one in the oil, the first will still have some time to cook. This quantity of mixture should produce around 30 gulab jamun. Once they are ready, take them out of the oil and drain them for a few seconds (no more than 10 seconds) on some paper kitchen towel. Next, put them in the syrup that you have made and make sure that they are covered with it. filling so don't eat too many at a time. The first ones will be covered by just pushing them under but as you procede with the batch, there will be less and less syrrup left. Towards the end of the batch, you will have to turn them over in they syrup pan to cover them - make sure that all of the gulab jamun's surface is covered by the syrup. Finally, put them on a plate and let them cool off. You can pour any surplus syrup over them once you have made the last one so that they all get a final drenching. Once they are cold, you might find that the syrup has solidified - don't worry about that, just gently prise any that are in the solid syrup out and they should emerge relatively unscathed. Pack up two or three for your meal's snack. You can also have them covered in custard (vegan of course) if you want.